Untethered deals with heavy drinking, depression, PTSD, isolation and struggling writers in search of identity, meaning and purpose to go on, having already crawled stoic through life’s darkness. ‘Untethered’ is largely an auto-biographical piece on identity and alternate paths walked, after facing up to moral junctions in life. It also considers the decisions made based on right and wrong felt at the time and the outcomes of this. It’s crime noir full of dirty realism. John’s bored in his witness protection program in Bristol. He’s both an ex SAS soldier and former doorman of the infamous Manchester club, the Hacienda. As he searches for meaning at the bottom of many a glass, madness sets in and cryptic messages start to arrive. One note comes with a knock on his door and a chance to find a missing girl; to start over again… as a Private Investigator. His therapist encourages him to put his demons on paper; to write it all out. As John battles with his past, could this writing lead him to find the girl, his future and maybe even love? Read Storgy magazine’s review of Untethered here. Take a look at this review of Untethered from Publisher’s Weekly here. Read John’s short story, ‘Milburn’s Last Class’ which is a finalist in Storgy magazine’s Flash Fiction competition. 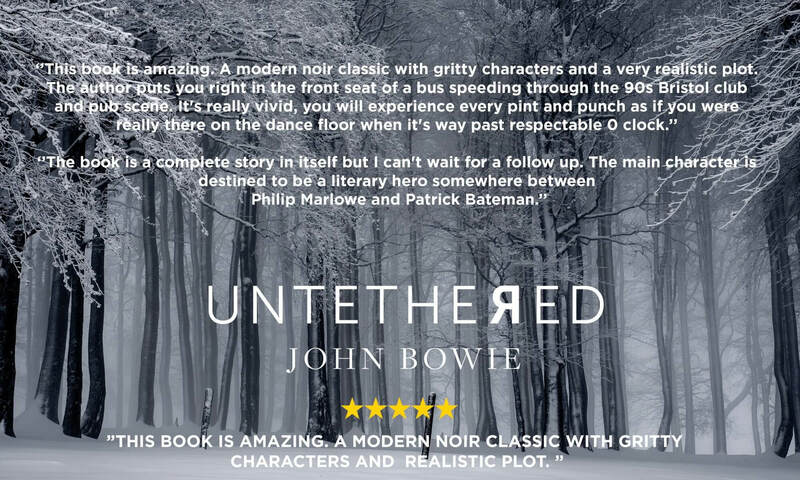 Here’s Paul D Brazill’s review of Untethered. Read this review on The Thrilling Detective of John’s book. Read John’s latest interview with Paul D. Brazill here. Find out more about Untethered here on Goodreads. BUY A LIMITED NUMBER SIGNED COPY OF UNTETHERED FROM OUR SHOP PAGE.